The Speed lite 600EX II-RT delivers impressive power, responsive performance and advanced, wireless communication for those who demand the very best in flash photography. 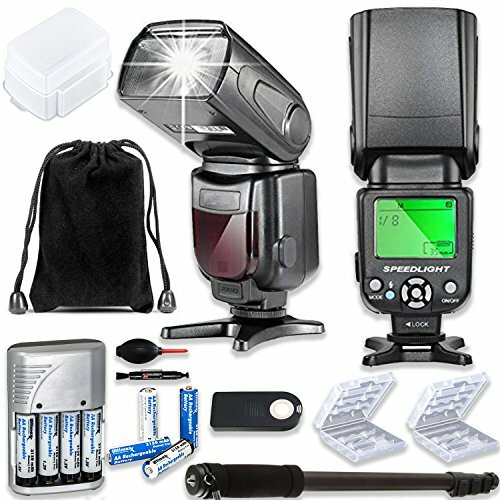 Featuring improved continuous performance up to 2.0x* faster than its predecessor, the Speed lite 600EX II-RT performs at a phenomenal speed, and reliably at that - new Quick Flash settings and a flash-readiness indicator help ensure priority shutter operation, even when the flash isn t fully recharged. It s also built for fast, convenient use virtually anywhere for any situation, with improved combination button and dial controls, a refined dust- and water-resistant body and new accessories tailor-made for enhanced lighting effects. For speedy and comprehensive flash photography on the go, the Speed lite 600EX II-RT delivers portable, professional performance with ease. 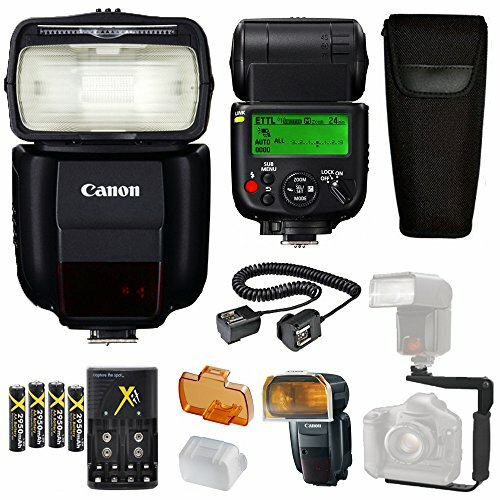 Canon Speedlite 600EX II-RT Flash - Speedlite 600EX II-RT delivers impressive power, responsive performance and advanced, wireless communication for those who demand the very best in flash photography. 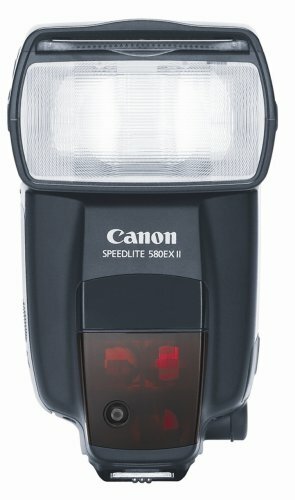 Featuring improved continuous performance up to 2.0x* faster than its predecessor, the Speedlite 600EX II-RT performs at a phenomenal speed, and reliably at that - new Quick Flash settings and a flash-readiness indicator help ensure priority shutter operation, even when the flash isn't fully recharged. It's also built for fast, convenient use virtually anywhere for any situation, with improved combination button and dial controls, a refined dust- and water-resistant body and new accessories tailor-made for enhanced lighting effects. For speedy and comprehensive flash photography on the go, the Speedlite 600EX II-RT delivers portable, professional performance with ease. Features - Guide Number: 197' at ISO 100 and 200mm. - 2.4 GHz Wireless Radio Transmission. - Compatible with Canon E-TTL / E-TTL II. - Zoom Range: 20-200mm (14mm with Panel). - Tilts from -7 to +90 - Rotates Left & Right 180 - 1.1-1.5x Improved Continuous Shooting. - High-Speed, 1st & 2nd Curtain Sync. - Bounce Adapter & Hard Color Filters. HIGH PERFORMANCE FLASH: Wireless multiple flash system with Zoom flash range of 20-200mm, with Guide number of 197 ft./60m at ISO 100 and 200mm, 1.1-1.5x Improved Continuous Shooting, High speed, 1st & 2nd Curtain Sync, bounce adapter and hard color filters. 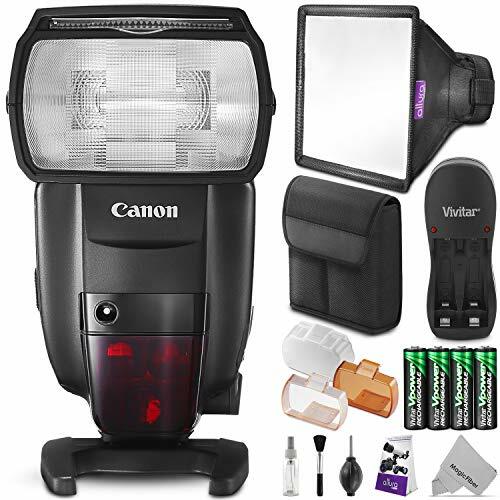 CANON COMPATIBILITIES: Canon 600EX II-RT Speedlite Flash is compatible with all Canon EOS REBEL DSLR Cameras with E-TTL II/ E-TTL Autoflash. (Including Canon Rebel T7i, T6i, T5i T4i T3i T3 T2i T1i XT XTi XSi SL1, CANON EOS 7560D 700D 650D 600D 550D 500D 450D 400D 350D 300D 1100D 1000D 100D 77D 60D 7D). 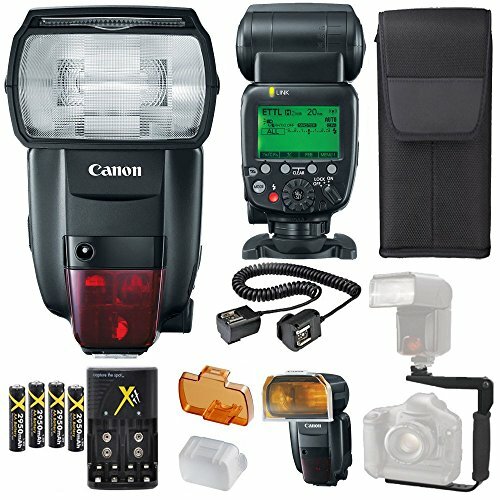 The Canon Speedlite 270EX II is a compact, high-performance flash unit designed for the evolving EOS enthusiast. 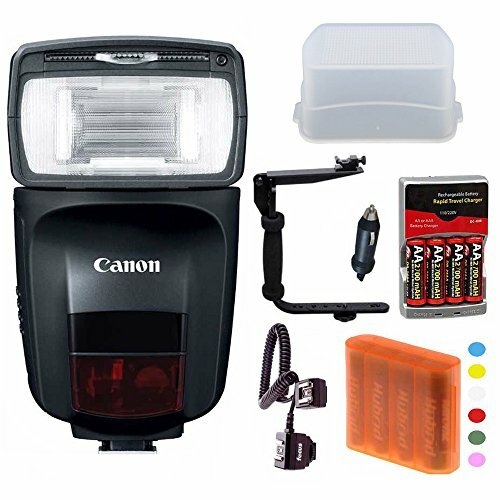 Developed for fun and easy flash shooting, when used with select Canon EOS DSLR cameras that have a master function, the Speedlite 270EX II can be used as a versatile wireless slave flash. 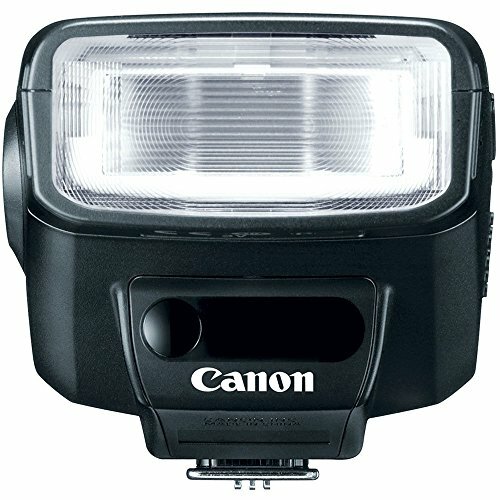 This Speedlite can also be used with other compact digital camera models equipped with a dedicated flash shoe mount. User-friendly in both function and design, the Speedlite 270EX II flash's Tele/Wide function easily and elegantly allows adjustment of illumination angle and guide number to match shooting conditions. On your photographic journey, the Speedlite 270EX II is primed to be there at every step. Slave function allows the flash to be triggered wirelessly (when used with an EOS DSLR with a master function). And Tele (50mm full-frame equivalent, max. Guide No. 89 ft./27m at ISO 100). Allowing the flash to be repositioned to illuminate the subject. The Canon MR-14EX II macro ring lite is ideal for EOS quality close-up photography when used in conjunction with one of Canon s EF Macro lenses. 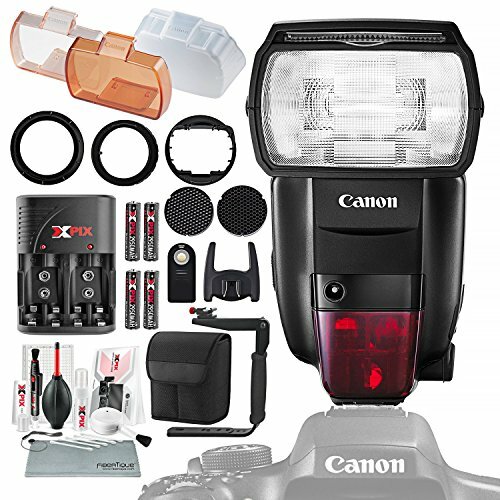 Redesigned as a perfect complement to contemporary digital SLR setups, it is the most advanced macro flash Canon has ever produced. It has a maximum Guide No. of 34.4 ft./10.5m at ISO 100 and a twin-tube design where both flash tubes can be directed to fire independently or together. Sophisticated white LED focusing lamps and two forms of modeling lights make for easy and accurate previewing of lighting effects. Infinitely adjustable in any lighting condition with its illuminated dot-matrix LCD, the MR-14EX II has 12 custom functions and supports E-TTL wireless auto flash when linked with one or more Speedlight 600EX-RT flashes. All this in a refined, compact design with shorter recycling times than its predecessor make the MR-14EX II a reliable, customizable choice. The speed Lite el-100 is a compact and versatile flash that will brighten darkened rooms and fill in and prevent an under-exposed or noisy image. The speed Lite el-100 offers the performance and features to capture beautiful photos in a variety of scenarios. With the ability to Pivot and swivel, you can bounce light off ceilings or walls, depending on the situation. 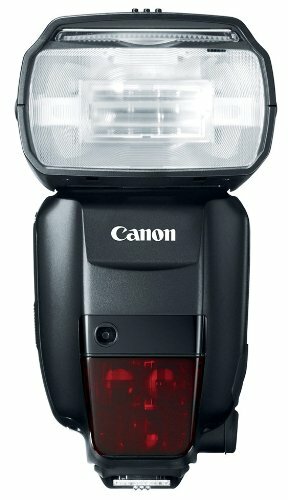 Canon's all-new Speedlite 470EX-AI is engineered to change the way you think about flash photography. As the world's first flash with an AI Bounce function (Auto Intelligent), the Speedlite 470EX-AI is equipped to detect the distance to your subject as well as the ceiling in order to calculate the ideal angle for the flash to achieve desired results, automatically. That's right, the flash head swivels in multiple directions to formulate the ideal bounce flash angle while you simply watch it work. The Speedlite 470EX-AI can even maintain defined exposure and bounce angles when you're alternating between horizontal and vertical compositions. In addition, it boasts a powerful maximum guide number of 47 (154 ft./47m) at ISO 100, a zooming flash head and numerous features for versatile and powerful flash photography. This plastic storage case is the perfect accessory for your loose AA batteries. It keeps your AA batteries both protected and easily accessible. No more batteries scattered in the dark corners of your utility drawer or backpack. This case can hold up to 4 AA batteries of any type (alkaline, rechargeable, li-ion, etc..) and features a secure snap closure. WORLD'S FIRST FLASH: With its revolutionary Auto Intelligent (AI) Bounce function*, the Speedlite 470EX-AI delivers a level of advanced, automatic operation that makes sophisticated flash photography both simple and fast. By automatically calculating the distance from the flash to the subject along with the wall or ceiling, the Speedlite 470EX-AI determines the optimal bounce angle and swivels into position to capture the appropriate camera exposure and flash output. AI.B FULL-AUTO AND SEMI AUTO: Featuring full and semi-automatic modes, the Speedlite 470EX-AI's Auto Intelligent (AI) Bounce function enhances the photography of bounce flash beginners and experts alike. With AI.B Full-auto mode, the flash can choose the optimal flash angle and exposure parameters, delivering natural lighting effects with ease. With AI.B Semi-auto mode, users can determine their own bounce settings and the flash can automatically maintain its angle. MAXIMUM GUIDE NUMBER OF 47 (154FT./ 47M) AT ISO 100: Boasting power for numerous shooting situations in a compact and lightweight package, the Speedlite 470EX-AI has a guide number of 47 (when focal distance is at 105mm). Even when shooting with telephoto lenses, or if the subject moves away from the camera, the Speedlite 470EX-AI can provide an ample burst of light for bright and evenly illuminated compositions. AF ASSIST BEAM EMISSION IN LOW LIGHT SCENES: The Speedlite 470EX-AI is designed to help the camera achieve sharp focus, especially in situations where the AF system may experience difficulties. With a default infrared beam system, the Speedlite 470EX-AI emits a steady infrared beam toward the subject, even during bounce shooting. This helps achieve sharp AF using up to 19 of the camera's AF points. BATTERY CASE: Snap Closure / Compatible with any type of AA battery. 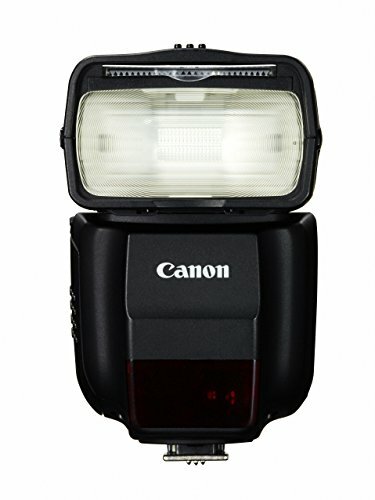 The Canon Speedlite 600EX-RT is engineered to provide a new level of performance and reliability for professional flash photography with today's most advanced DSLRs. With wireless two-way radio communication, the Speedlite 600 EX-RT allows photographers to expand their creativity using wireless speedlites with the reliability of radio triggering. The Speedlite 600EX-RT offers an expanded zoom range and a higher guide number, plus a number of improvements over its predecessor in both operation and feel. It features a new dot-matrix LCD panel for display of all pertinent shooting information, backlit controls plus an internal sound generator. 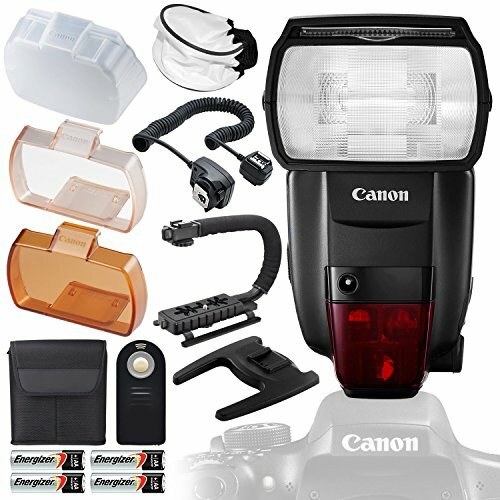 Reliability is ensured with improved hot shoe contacts, improved flash head durability and the most comprehensive dust and water sealing system ever on a Canon Speedlite flash. A new color filter holder helps maintain accurate color in a variety of ambient light conditions. Beyond its distinct automated capabilities, the 470EX-AI is also distinguished by its apt flash specs, including E-TTL/E-TTL II compatibility, a guide number of 154' at ISO 100 and 105mm, a zoom head with coverage from 24-105mm, and a pull-out diffuser to widen this coverage to 14mm. Manual stepless adjustment over bounce is possible with a tilting range up to 120 along with +/- 180 rotation, and off-camera triggering is possible using the optical slave mode. 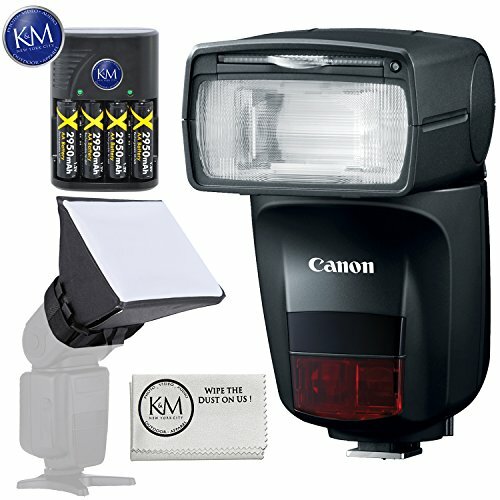 This K&M Flash Bundle comes with All Standard Canon Supplied Accessories + 1 Year Canon USA Limited Warranty. 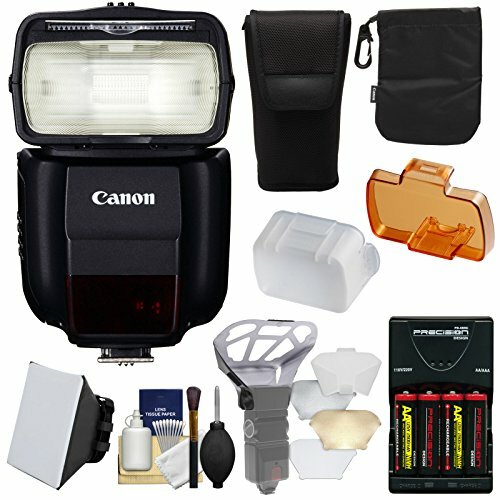 In the Canon Box: Canon Speedlite 470EX-AI, SBA-E4 Bounce Adapter, Stand, Speedlite Soft Case. 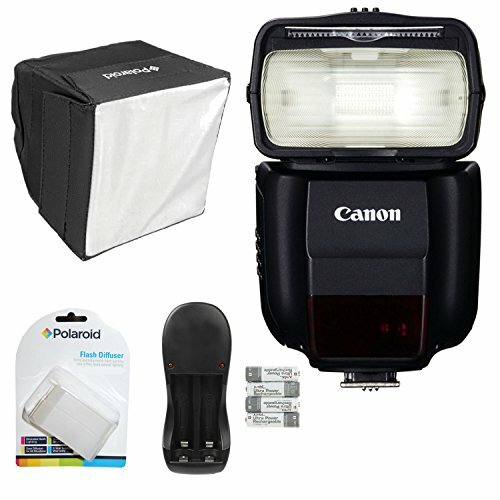 K&M Flash Bundle includes: Mini Soft Box, 4 AA Rechargeable Batteries with Charger, K&M Micro Fiber Cloth. Product Highlights 470EX-AI: Auto Intelligent Bounce Head, Compatible with Canon E-TTL / E-TTL II, Guide Number: 154' at ISO 100 and 105mm, Zoom Range: 24-105mm (14mm with Panel), Tilts Upward 120 , +/- 180 Rotation, AI.B Full-Auto and AI.B Semi-Auto Modes, Optical Receiver Mode, LCD Panel, AF Assist Beam, Runs on 4x AA Batteries. 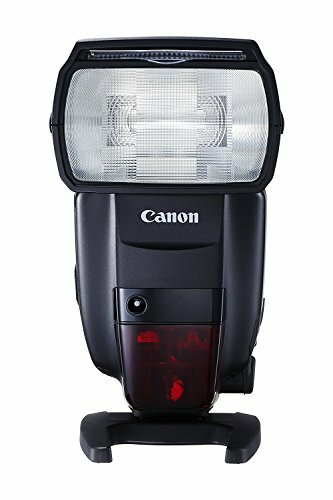 Canon radio flash capabilities are trickling down from their flagship model with the integration of a 2.4 GHz wireless triggering system with master and slave capabilities in the mid-range Speedlite 430EX III-RT. Much like its predecessor, the E-TTL / E-TTL II unit has a guide number of 141' at ISO 100 and 105mm along with a zoom range of 24-105mm and a wide panel that extends coverage down to 14mm. Bounce has been expanded with the ability to rotate 150 right and 180 left as well as tilt upwards 90 . Enhancing operation are a dot-matrix LCD and a Multi Dial for smooth maneuvering of the menu settings. In addition to the newly implemented radio system for wireless flash, optical slave transmission is still available for greater functionality. Versatility is still key with this compact unit, offering high-speed, 1st and 2nd curtain sync modes along with a variety of custom functions for setting the Speedlite up exactly as you need. 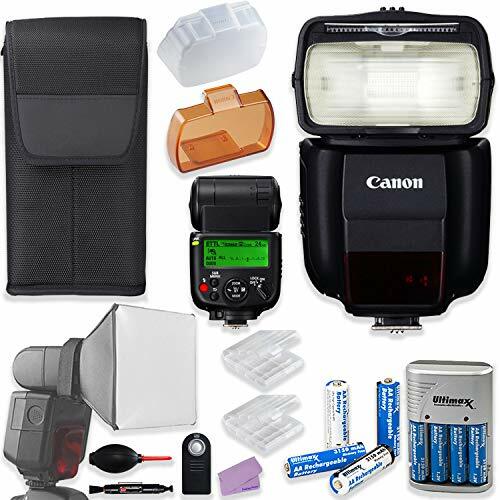 Additionally the bundle comes high quality accessories like flash diffuser pouch, battery case, pen-blower and more..
For stunning flash photography even in complex lighting environments, the Canon Speedlite 430EX III-RT offers a fantastic combination of advanced features and simple operation. Compact in size, yet powerful in range, the Speedlite 430EX III-RT not only provides a portable light source, it has easy to manage features that can enhance contrast, color temperature, brightness and focus of light for more natural-looking photography. Whether bouncing the light source off a wall or ceiling, using its integrated Catch light panel to brighten up a subjects face, or using its bounce adapter to soften the intensity of the flash beam, the Speedlite 430EX III-RT is impressively versatile. With convenient custom and personal functions, speedy recycle times and advanced wireless photography options, the Speedlite 430EX III-RT can be an indispensable accessory for photographers ready to take their flash photography to the next level. Zoom flash head covers a wide range of 20-200mm; maximum guide number is 197ft./60m at ISO 100. Improved performance of continuous flash by approx. 1.1 to 1.5x for fast firing (up to 2.0x if used with optional Compact Battery Pack CP-E4N). Dust and water-resistant body for reliable operation in various environments. A Macro Ring Light that ensures correct exposure for extreme close-ups; Twin tubes fire together or independently. Canon's Macro Ring Lite MR-14EX for close-up and macro shooting comes equipped with many features and capabilities. 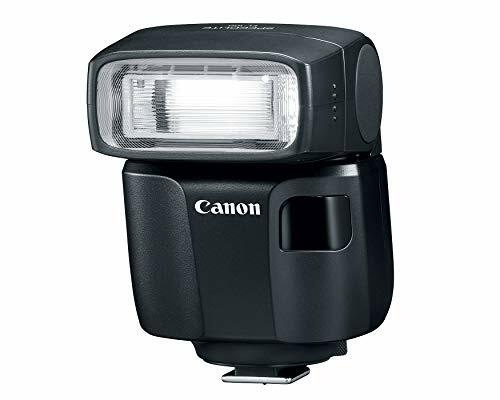 Utilizing E-TTL (enhanced through- the-lens mode) technology, it takes full advantage of the flash performance of the Canon EOS-1V, EOS-3, and other E-TTL cameras, and also supports E-TTL wireless auto flash, when used with at least one Canon 550EX Speedlite flash. The circular twin flash tubes of the MR-14EX can fire at even power, or vary between themselves over a six-stop range. The controller unit has an illuminated LCD panel, and the MR14-EX also accepts optional high-capacity battery packs. The MR-14EX attaches directly to Canon's EF 50mm f/2.5 compact macro, EF 100mm f/2.8 macro (both versions), and MP-E 65mm macrophoto lenses, and can also be used with EF 180mm f/3.5L macro USM via the Macrolite adapter 72C. For those demanding the best in flash photography, the Speedlite 600EX II-RT is the solution in delivering impressive power, responsive performance and advanced, wireless communication. 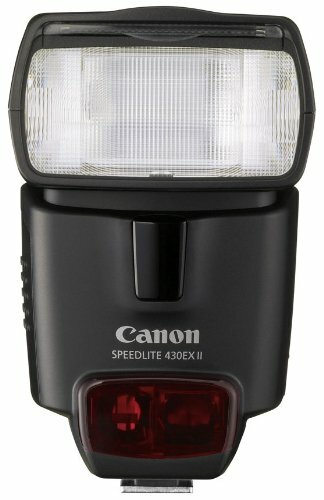 With performance up to 2.0x faster than its predecessor, this speedlite operates at amazing speed, and is reliable as well. Its versatile and practical build allow for convenient use in most any situation. Delivering professional performance with ease, the Speedlite 600EX II-RT is here to provide you with a pleasurable and productive shooting experience. The two-way 2.4 GHz radio system provides added reliability and a range up to 98.4' among up to 5 groups with a total of 15 individual Speedlites. Compatible with all Canon EOS DSLR Camera including Rebel T3, T4, T6, T7, T1i, T2i, T3i, T4i, T5i, T6i, T7i EOS 70D, 77D, 80D, 5D MARK II, 5D MARKK III, 5D MARK IV, 6D, 6D MARK II, 7D MARK II, 1D, 1DX and more..
High Speed speed light TTL flash for Canon cameras. Works perfectly with 4 AA batteries. Swinging/Tilting flash head (bounce flash). 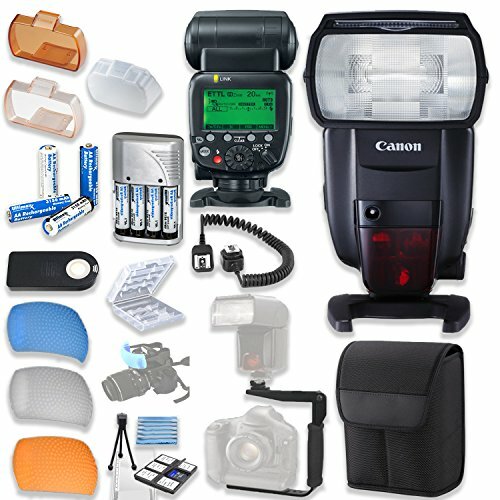 Additionally the bundle comes high quality accessories like monopod, battery case,cleaning kit and more..
Advance-level performance for professional flash photography with the Canon Speedlite 600EX II-RT featuring a flash head that covers a wide range of 20-200mm, a max guide number of 197 feet at ISO 100, and continuous shooting of 1.1-1.5x. Versatile wireless flash shooting options support for 2.4 GHz radio transmission wireless functionality as well as optical transmission. AF assist beam is compatible with up to 61-point High Density Reticular AF systems. Simple, easy to use features with a backlit dot-matrix LCD display and Dial controls for smooth maneuvering of the menu settings. Flash tilts from -7 to +90 degrees and rotates left and right to 180 degrees. Maximum customization for creative flexibility using the 15 Custom Functions and 6 Personal Functions. Recycle time as fast as 0.5-5.5 seconds, which can be sped up to 0.3-3.3 in Quick Flash Mode. Stroboscopic mode and high-speed, first and second curtain sync settings for greater control over your image's final look. 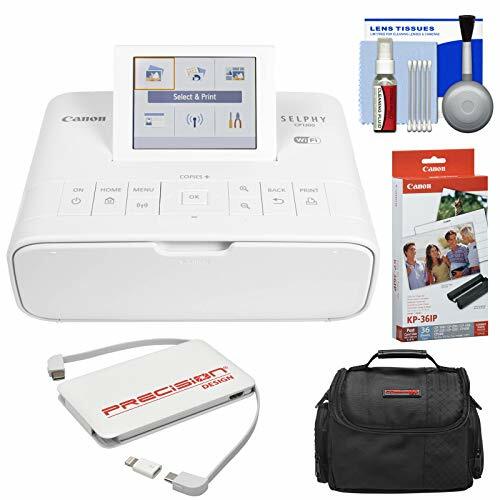 Additional useful accessories include a bounce adapter and hard color filters, which help maintain accurate color in a variety of ambient light conditions. Powered by 4 AA batteries. 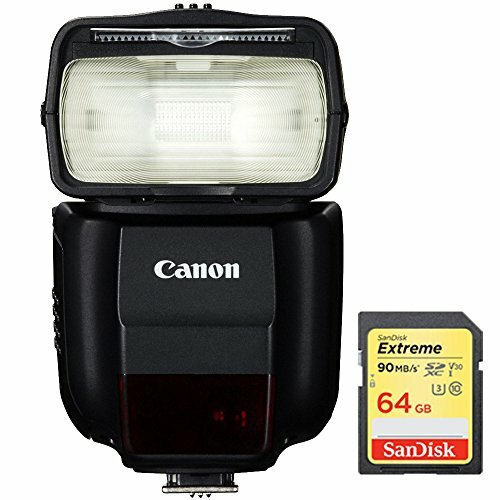 Connect the 600-EX 11-RT to your compatible Canon E-TT/E-TTL II flash and the result will be improved flash performance for professional and breathtaking shots. Universal Remote - Prevents camera shake resulting in sharper, high-quality images. Powerful Guide Number of 197' at ISO 100 and Fast Recycle Time of 0.5-5.5 seconds, which can be sped up to 0.3-3.3 in Quick Flash Mode. 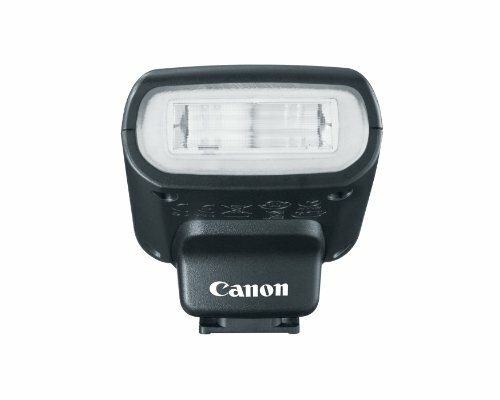 The Speedlite 90EX combines simplicity with a compact, lightweight design, making it ideal for the Canon EOS M Digital Camera. With many features directly accessed through the camera s menu system, the Speedlite 90EX offers easy and intuitive operation. It supports 24mm wide-angle lenses (35mm terms) and can control multiple flash units for advanced, creative lighting effects. 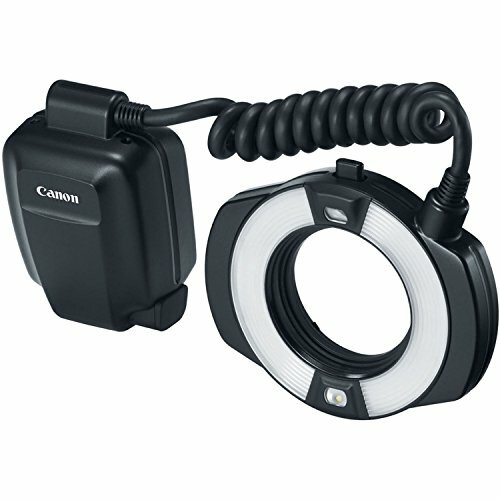 The Speedlite 90EX also features a standard Canon EOS hot shoe mount for compatibility with all EOS SLRs. 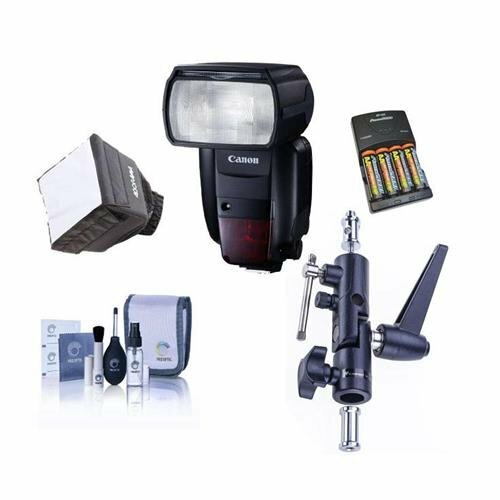 5) Precision Design 6-Piece Camera & Lens Cleaning Kit For stunning flash photography even in complex lighting environments, the Canon Speedlite 430EX III-RT offers a fantastic combination of advanced features and simple operation. Compact in size, yet powerful in range, the Speedlite 430EX III-RT not only provides a portable light source, it has easy to manage features that can enhance contrast, color temperature, brightness and focus of light for more natural-looking photography. Whether bouncing the light source off a wall or ceiling, using its integrated Catchlight panel to brighten up a subject's face, or using its bounce adapter to soften the intensity of the flash beam, the Speedlite 430EX III-RT is impressively versatile. The Precision Design Universal Soft Box Flash Diffuser enlarges and redirects the light from the flash and then further softens the light by passing it through a frosted diffuser. It achieves an extremely soft look with minimal shadows. It folds flat and stores easily in any camera bag. Includes adjustable velcro strap and elastic band for securing the diffuser to almost any size flash unit. The Precision Design PD-UFDB Universal Flash Diffuser Bouncer features 3 interchangeable inserts for the perfect light output and color balance. It enlarges and diffuses the light, and helps to eliminate red-eye. It comes with white, silver and gold inserts, as well as a removable frosted diffusion screen. Provide your camera with plenty of power with 4 AA ultra-high capacity 2900mAh Nickel Metal Hydride (NiMH) batteries and a multi-voltage rapid charger. The Precision Design 5000mAh Power Bank Portable Charger quickly and safely charges your smartphone, tablet, digital camera, etc. With its built-in USB Type-C, micro USB cable and Lightning connector, it can charge a wide variety of devices. For added coverage and functionality, the flash's zoom head can reach from 20-200mm, with the option for wide 14mm coverage when the built-in diffusion panel is used.